It stormed heavily all night so I made the mistake of looking at the forecast this morning, and saw it was going to storm heavily all day too. We decided to zero, and then it never rained again all day. I’m never looking at a forecast again. This happens every single time. We had a good zero though. We ran into Rutland and had a great brunch at Denny’s. Riner was tied outside and all the employees at Denny’s made their way out at one time or another to give him water and love on him. He’s such a good dog, he’s got a fan club wherever we go. We went to the mall and I got new pants at EMS. The pants I got back that I wore at the beginning of the trail were way too big since I’ve lost weight, and having them all bunched with a drawstring or belt under my pack hipbelt was bruising me. The new pants fit well so I should no longer have that problem. 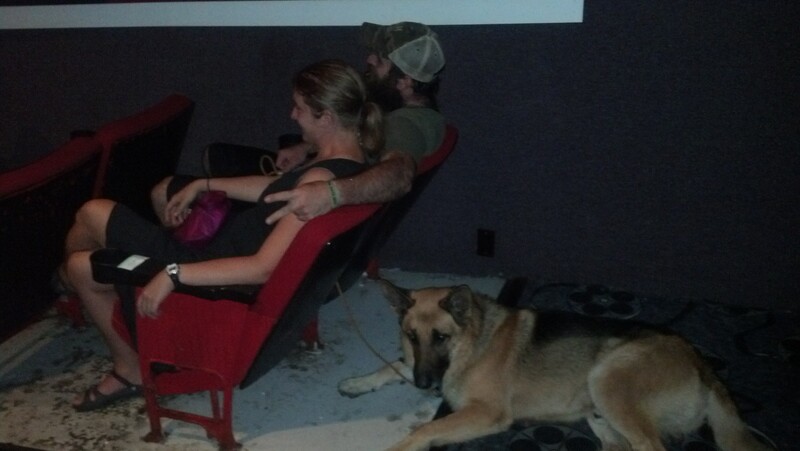 Next we went to the movies, and they even let Riner in. We saw “We’re the Millers” and it was great, very funny. We did a quick resupply at the grocery store, then went back to the trailhead for a campfire. We weren’t there long though before another storm rolled in and we all ran for cover. We needed an early night any way since tomorrow will be a long day.